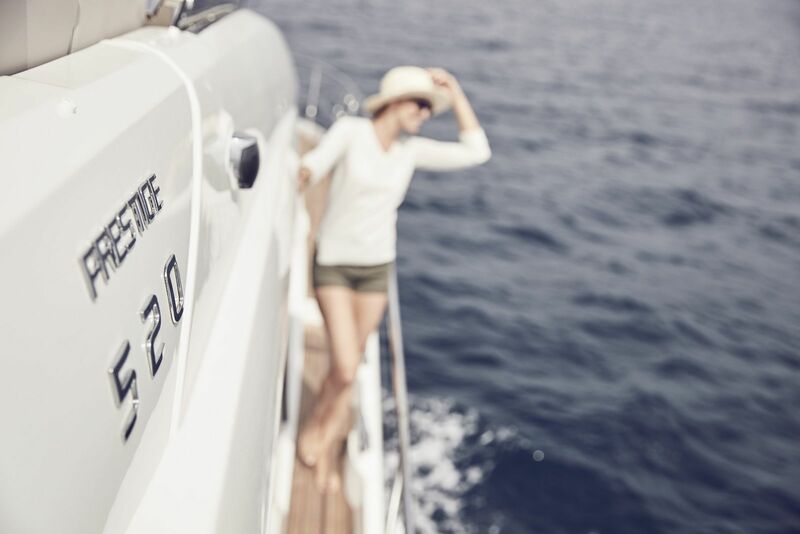 This new model has inherited the strengths of her predecessor, yet she also features her own innovations. 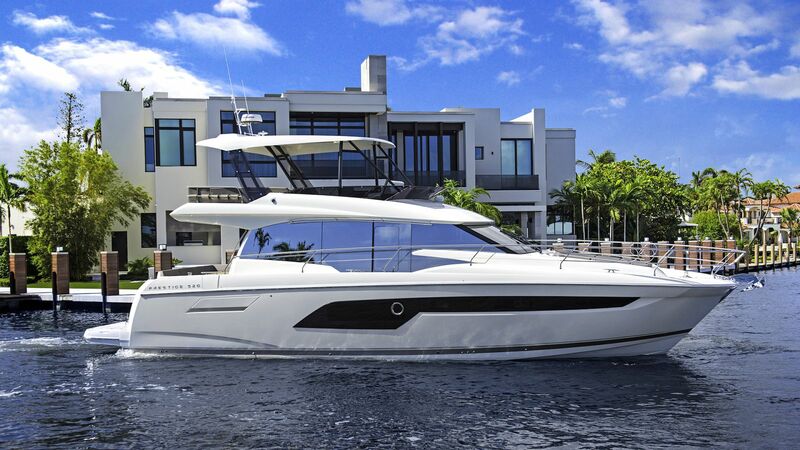 The true Prestige spirit can be felt in this ingenious, top-of-the-line model. 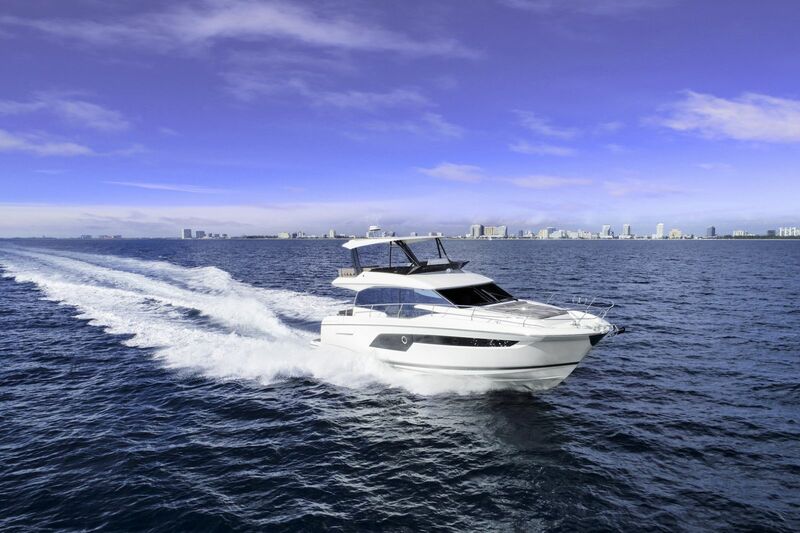 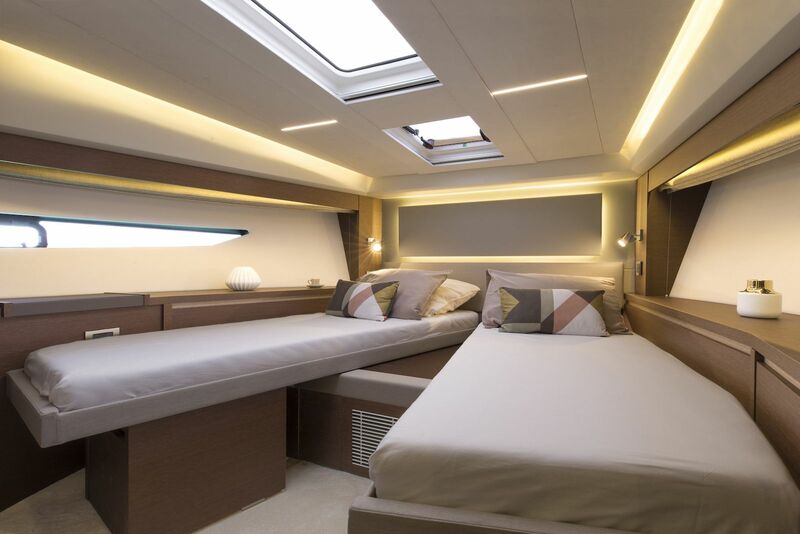 In a pure, dynamic style, the Prestige 520 Fly offers multiple zones for relaxing in comfort. 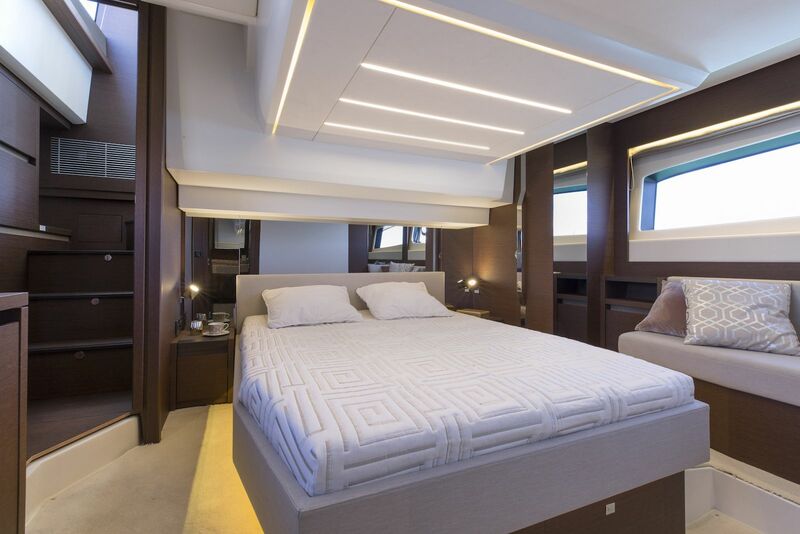 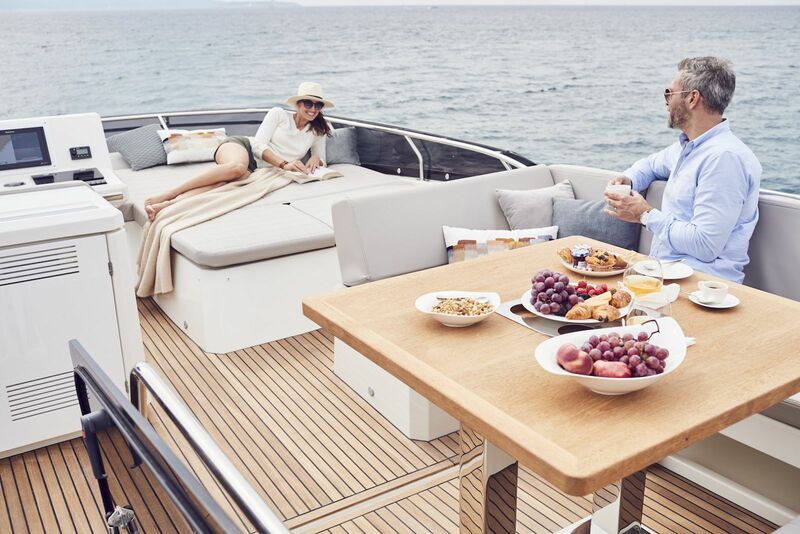 The most obvious of these zones, we have the XXL Flybridge, unique on a motor yacht of 52 feet! 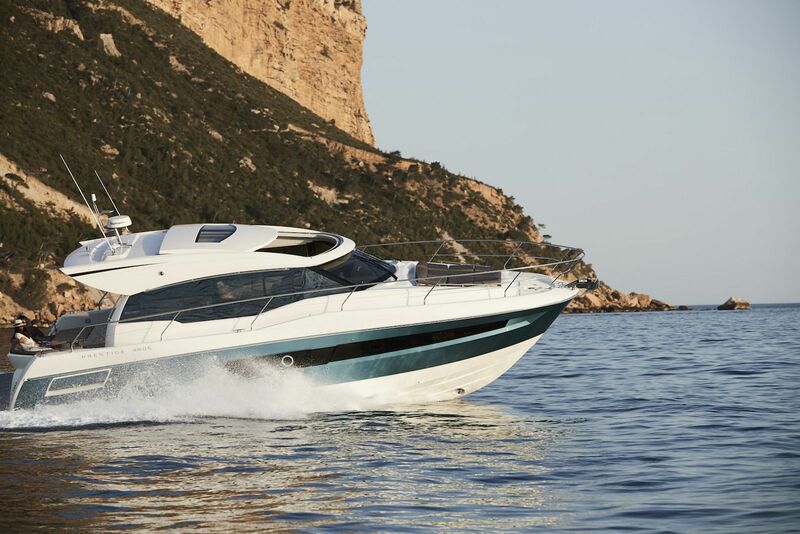 What really distinguishes the Prestige 520 Fly from the competition is the humungous hard top on the fly. 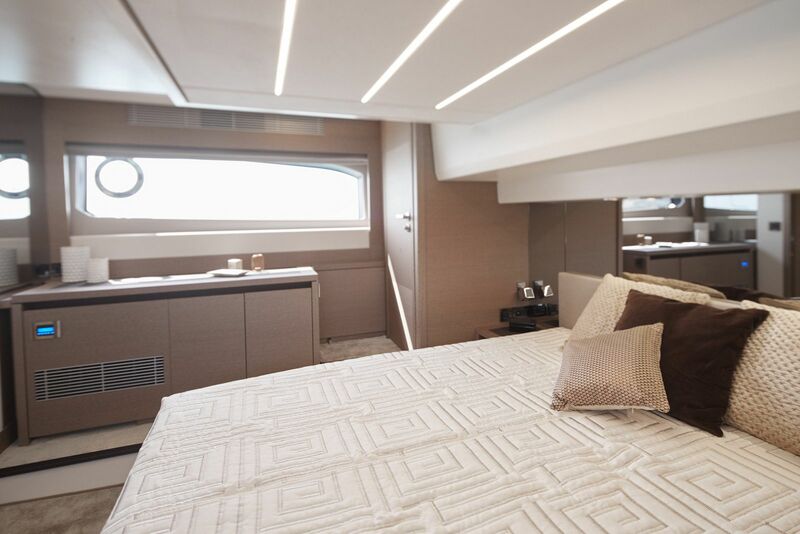 The three-stateroom layout is also a big draw to this vessel over others because the use of space is simply impeccable. 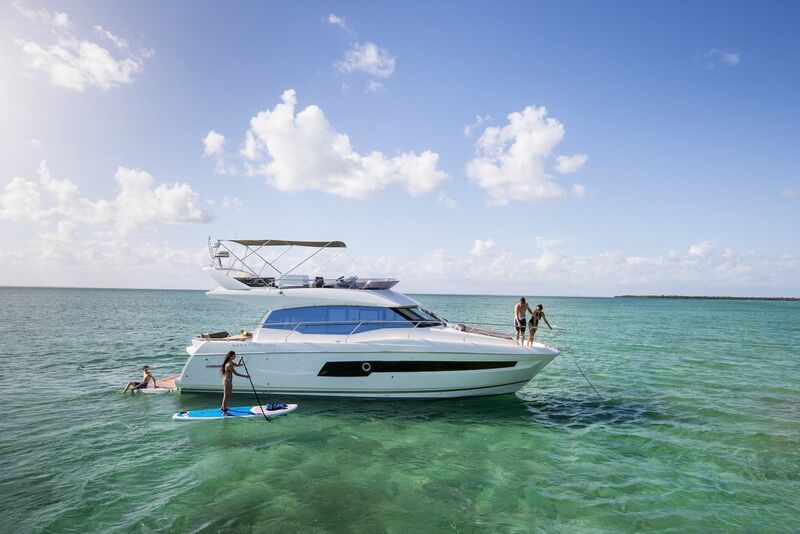 The Prestige 520 Fly can be spotted and recognized from a significant distance and one the biggest contributing factors is the elegant full hull windows that has become iconic in the world of yachts. 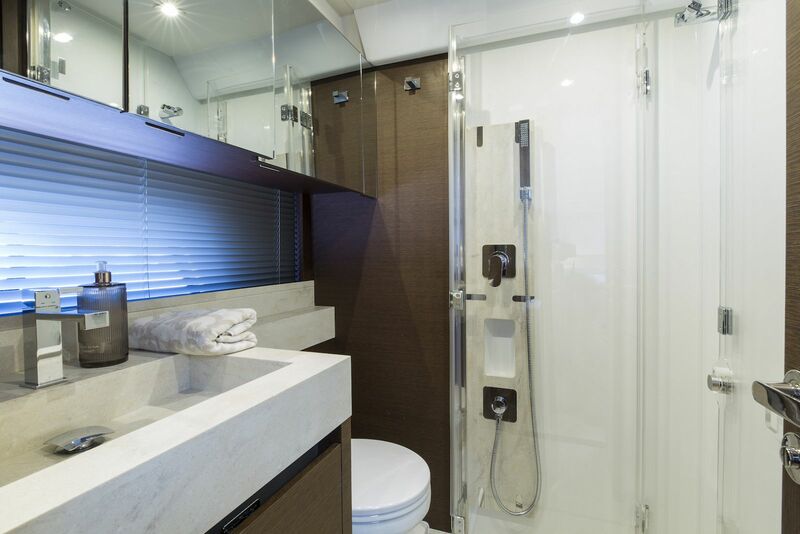 Mirrored glass for the salon windows adds dramatic detail to the exterior views of the vessel. 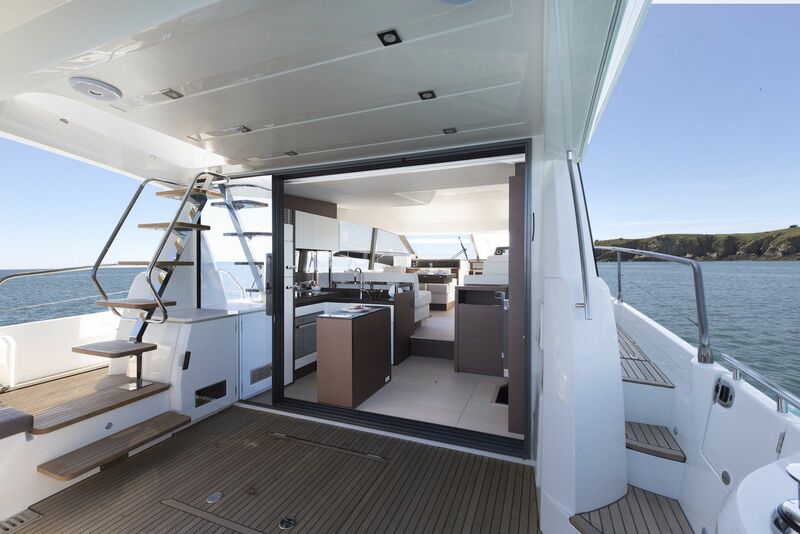 Extremely large windows contribute to the soft, warm atmosphere on the interior, while offering unimpeded visibility. 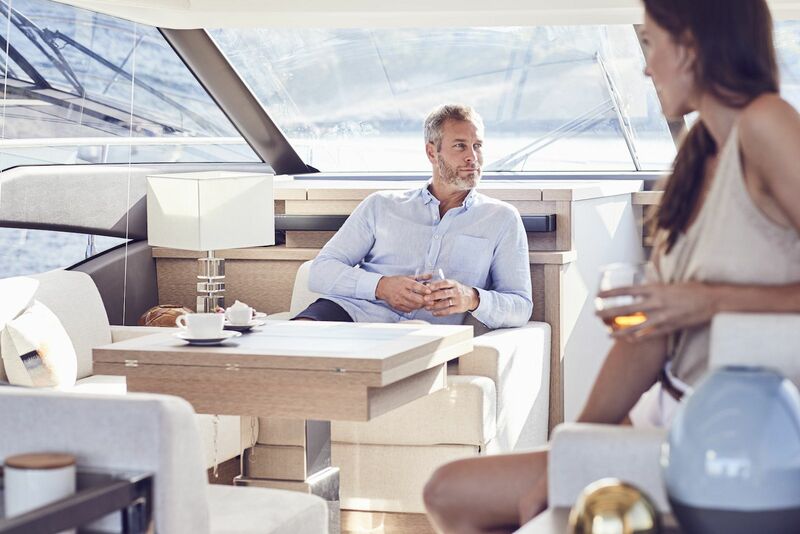 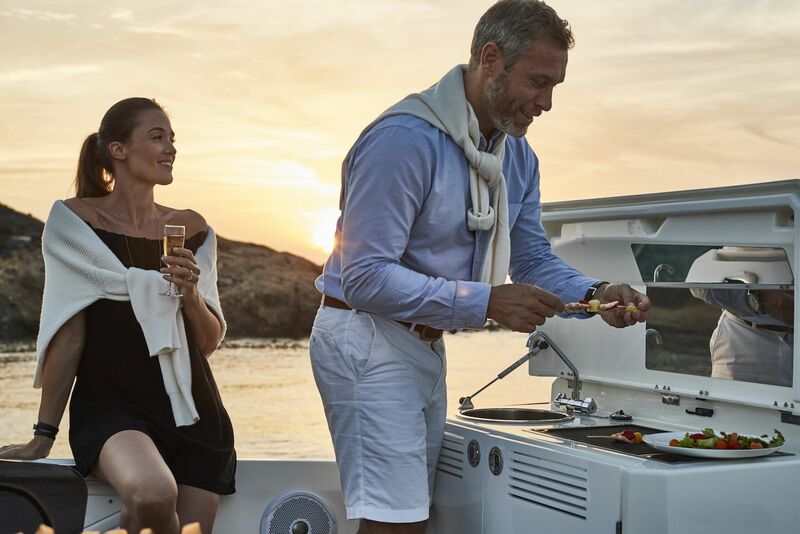 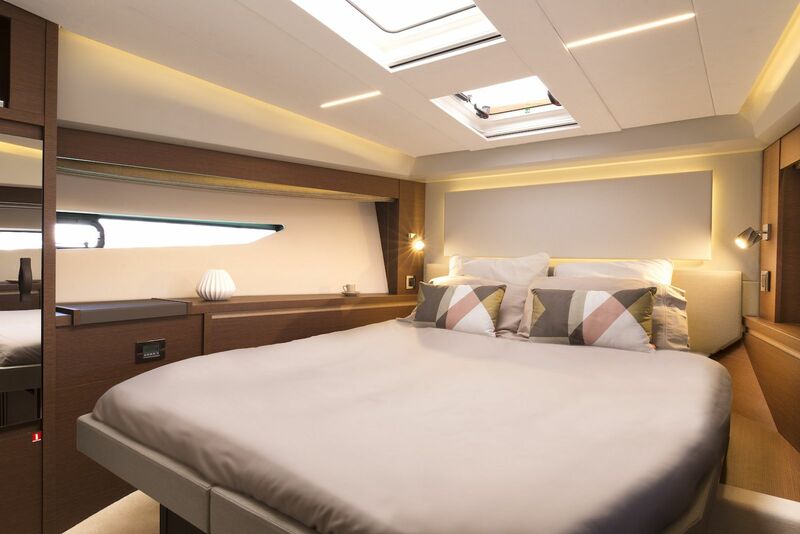 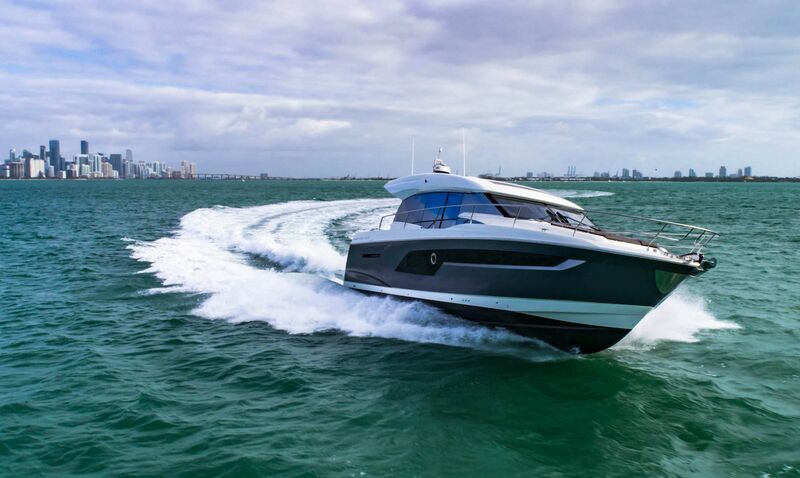 At the stern of the Prestige 520 S there are customization options that can transform the platform into a galley, a tender garage, jet tender garage or even a full crew quarter. 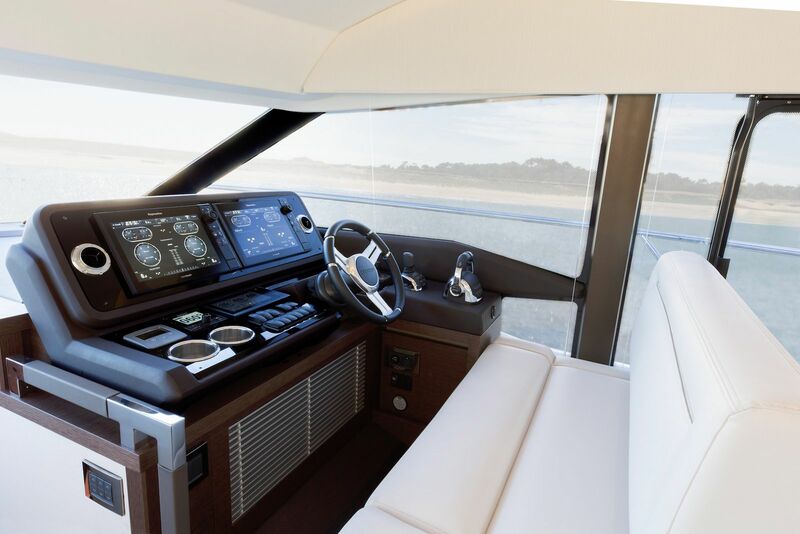 This models also is equipped with an autostep system which, as it sounds, automatically creates steps for easy access to the cockpit when the platform is lowered into the water. 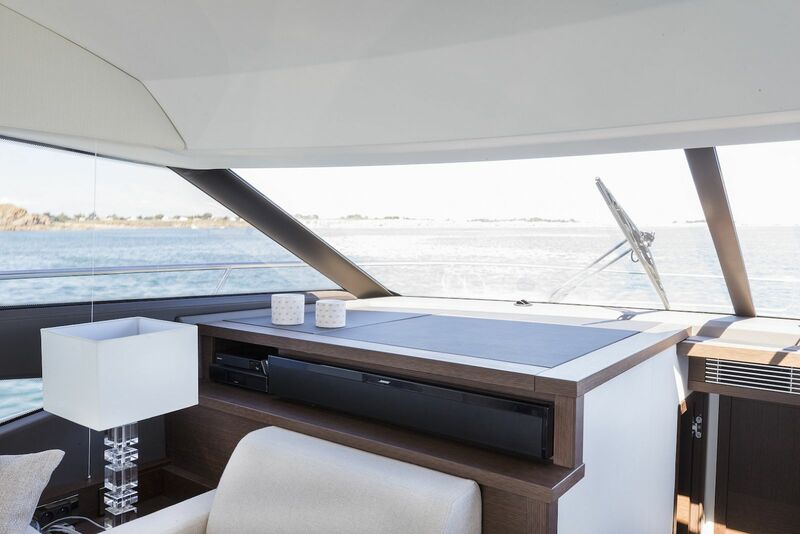 An optional sun shade will retract and extend with a push of a button. 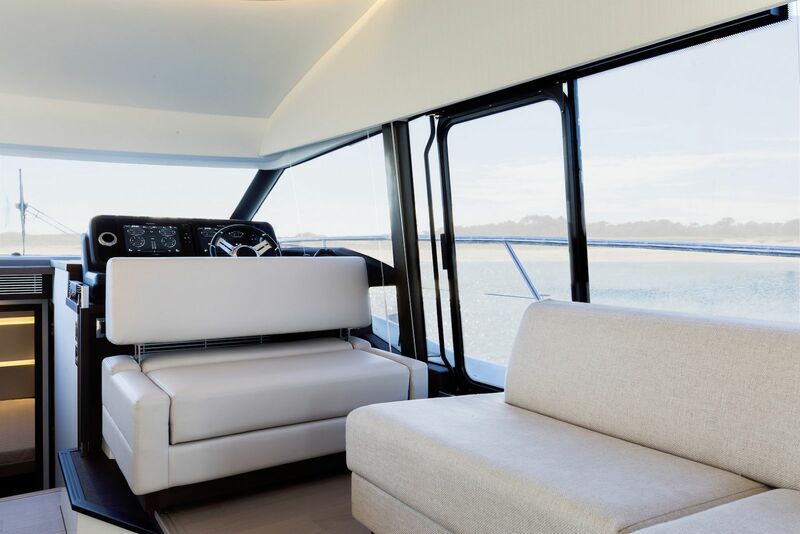 The L-Shaped sofa in the cockpit has a coffee-sized table until it is unfolded into a dining table. 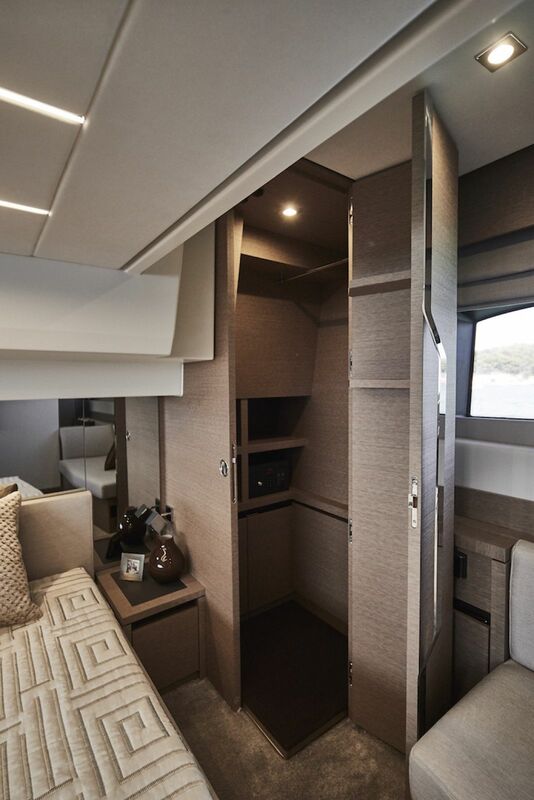 This makes the cockpit an enjoyable place to entertain any time of day. 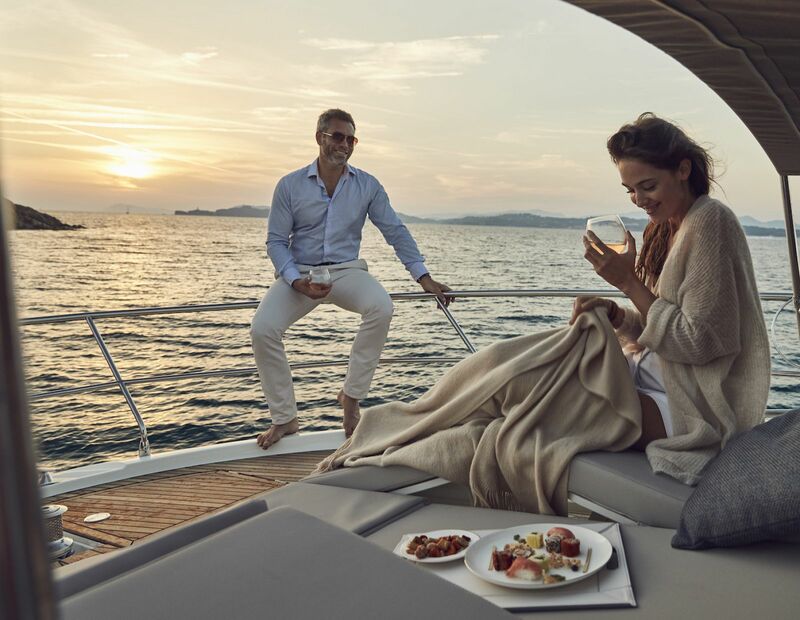 On the bow there is an extra-large sunpad that will adjust to different positions making this spot even more enjoyable than it already is. 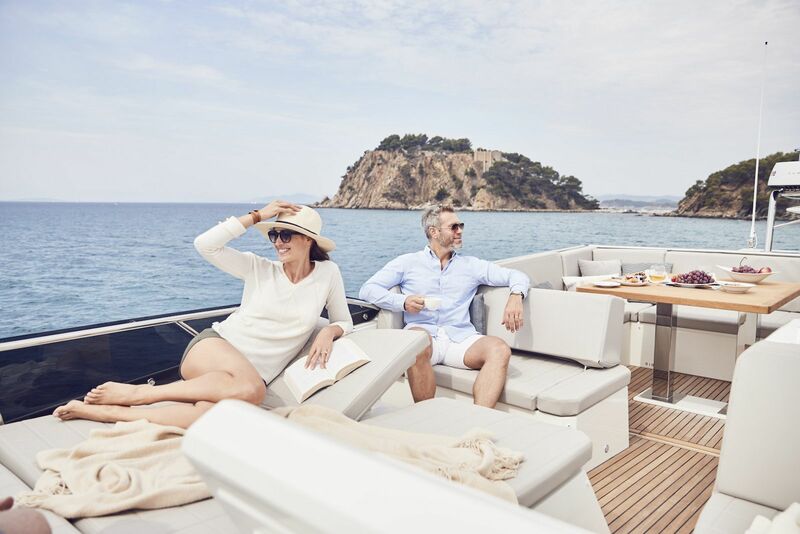 The cabana style bimini coupled with these adjustable lounges will make this one of the most sought-after places to relax on board. 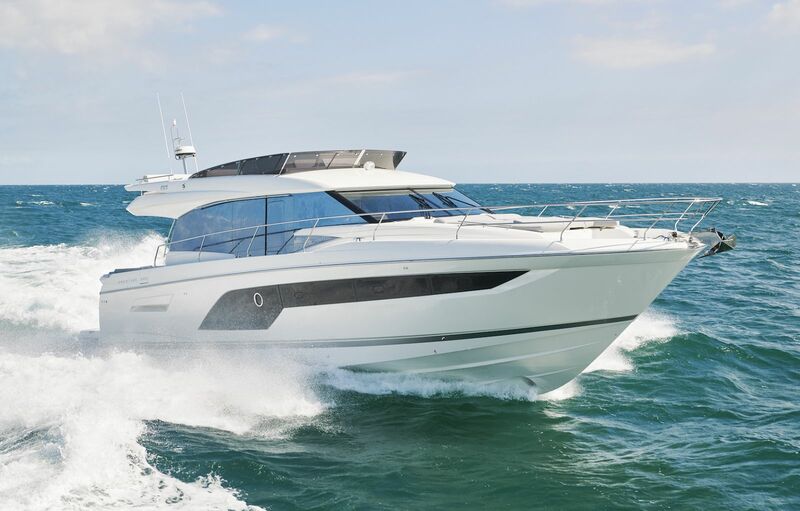 As mentioned, the available hardtop on the Prestige 520 Fly is something to be desired and is often an example of what most manufacturers try to mimic when designing a flybridge boat of this size. 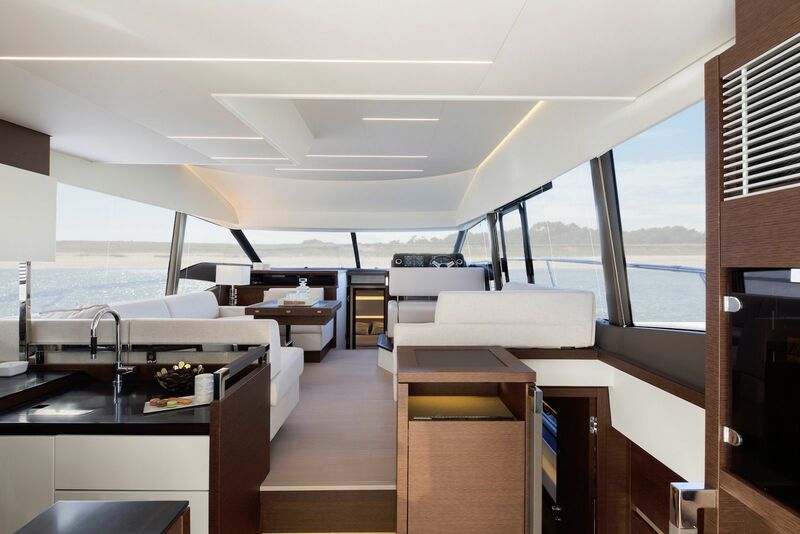 When on board and up on the Fly, the views and possibilities seem endless. 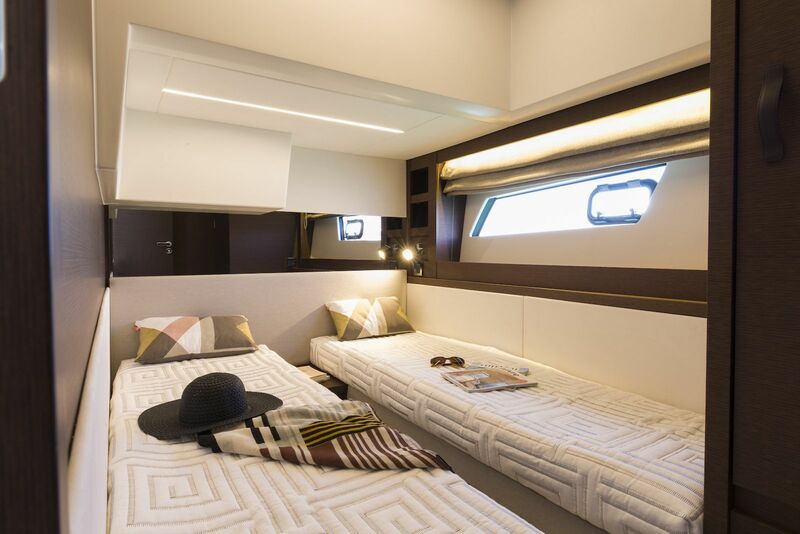 There are two lounges plus a dinette which all provide plenty of room for all sorts of activities. 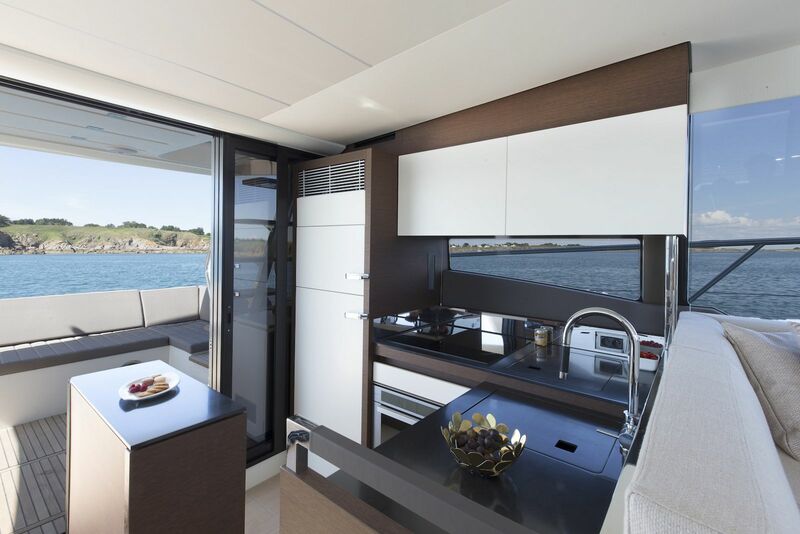 A refrigerator, electric grill and sink on the bridge allows for hours and hours of fun all without having to ever descend to the main deck. 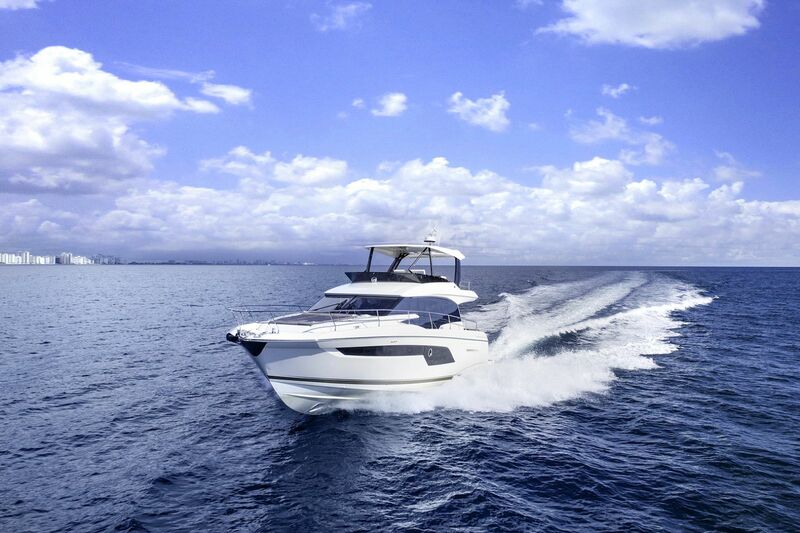 The helm up here is as functional as it is sophisticated with the joystick power, bow thruster and twin displays. 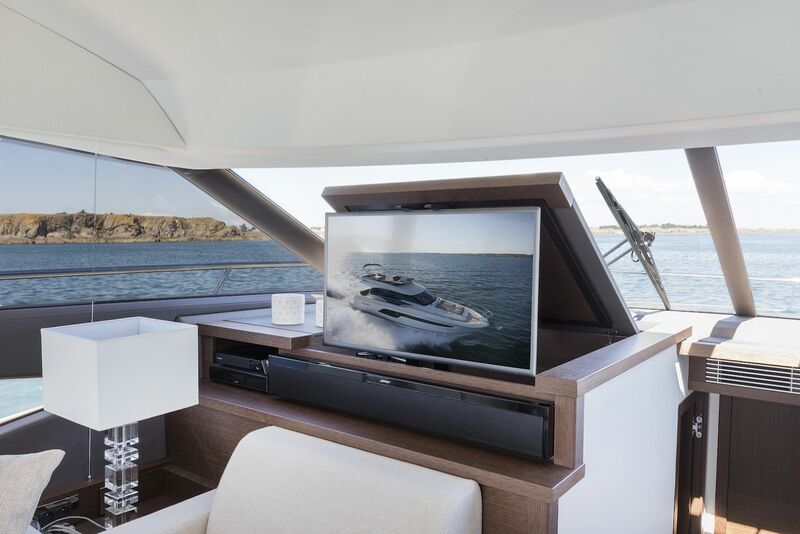 Prestige Yachts released this latest video on the new 520 Flybridge. 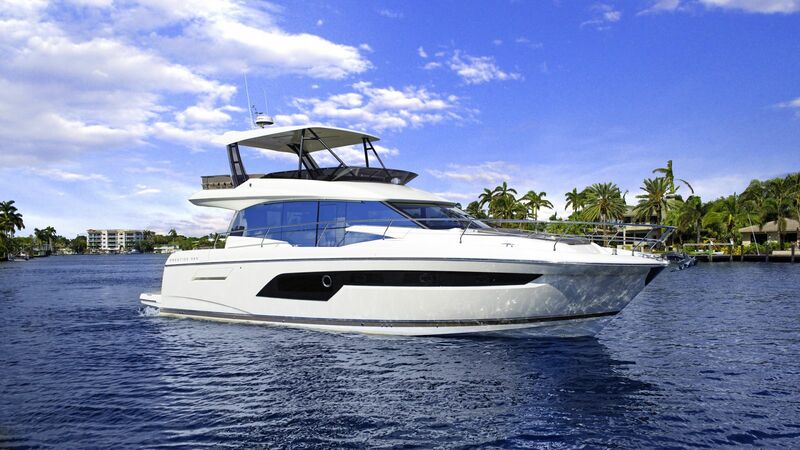 The editors from Boats.com review the new 520 Flybridge from Prestige Yachts at its premier.